5. What kind of options for character progression exist in the game? Is it limited to better loot/gear, or can hit and mana points be increased? Well, every third level there is a little merchant that wanders around the level somewhere. Ryan asked me how a merchant could live with all those monsters without getting murdered, so I came up with this idea of this little buddhistic, portly, fellow who has learned how to live peacefully with the monsters. Again, it made me chuckle, so into the game it went. So when you encounter him you can spend the gold you collect throughout the levels to upgrade your health and / or mana. Not exactly Buddhism, but oh well. I have tried to balance the game in such a way that if you completely miss the vendor more than 2 times, the game gets VERY hard, but if you are careful and find enough gold for a couple of upgrades, the difficulty stays about the same throughout the game. We also have a system where more powerful cards are only given to you at the higher levels. Each card has a rating from poor to elite and the elite cards will drop more frequently at the later levels. So that coupled with the character upgrades gives the player a sense of progression / getting better / stronger. 6. What is the single most powerful card in the game? Ohhh.. that's a tough question. I have tried to give every strong card a drawback that can be lethal if not properly managed. For example, Lords Finger kills most enemies in one hit, but the mana cost is so steep that it drains you after one use. Of course this can be mitigated by equipping magical items that allows you to regenerate mana faster. And of course all cards degenerate at the same rate, so even the most powerful cards you find will eventually disintegrate and leave you vulnerable. Summoning cards are very powerful as they draw fire away from you and help you with attacking monsters. The drawback of those is that their health degenerates with 2 points every turn, so they don't last for long, and you have the cast them again which uses them up pretty quickly. Oh, and it also depends on if you have a weapon equipped and what bonuses that weapon gives. If you find a melee based weapon that gives a great fire bonus, for example, that weapon is useless if you are just have ranged cards in your hand because the bonuses for the melee weapons only apply on the cards that are adjacent based. It also depends on what kind of monster you are facing. Certain monsters are better to stay away from and others you want to get as close to as possible as fast as you can. Yeah. Difficult question. I do like me a good summon card, though. 7. What plans do you have for the game post-launch? Any plans for additional content or possibly even outdoor levels? Post launch I am sure there will be bug fixes and tweaks to monsters and cards. As we do that, we are looking into porting the game to Android and Windows phones and tablets. Long term plans I have would be different characters to chose from that have their own traits and unique cards to find. The map is still pretty open so more levels wouldn't surprise me. We haven't set in stone what new features are going in after launch. 8. When did you decide to have a single hero with no accompanying party? Does that present you with any creative opportunities that a party-based game might restrict? From the early paper versions we knew it was going to be a roguelike and they are classically one lone hero against the odds. It's been one of those itches that I needed to scratch for awhile now. We never really talked about party based systems because we both knew, after having worked on it for awhile, that it would just be too much work for 2 people. In a party based system we would need unique skills for each class, probably an inventory system and more. Also if there's a party I would assume some form of multiplayer option would be available and I am just starting to sweat thinking about that. I think, creatively, it actually gave us the opportunity to create one of the nicer things about Card Dungeon, which is that you don't play the same class for very long (or at least if you want to survive). It's just fun to switch from being a melee based warrior to a trap casting summoner to a fire mage to a ice mage to a healer all within the same level. It helps keep the mundanity of being a murder hobo at bay. 9. If someone has played Card Hunter, which also uses table-top role playing games as its visual foundation, what separates Card Dungeon from Card Hunter? Why should they pay for Card Dungeon when Card Hunter is F2P? Hmm... why should you pay for Card Dungeon? Well, there are no ads, no in app purchases, no up-sale or locked content for you purchase / unlock. Buy the game once and the game is yours. I am sure that I'll be losing out on revenue because I didn't do F2P, but I don't like most games that goes that route. Card Hunter is a great example of F2P done right, but honestly I don't know how to make a successful free game. 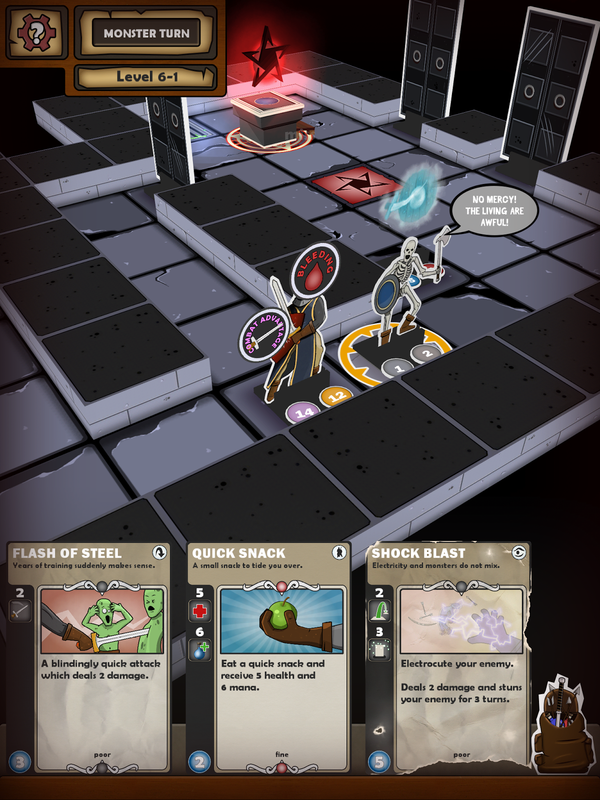 Card Dungeon offers something unique, a different gameplay experience, than other games on the mobile market today.